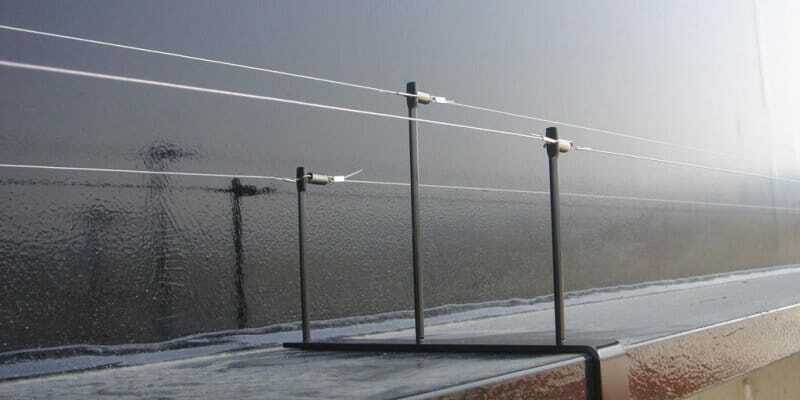 Pest Bird Wire Systems are a cost-effective, extremely versatile and totally humane bird deterrent system which can be used effectively to keep pigeons and gulls off buildings and structures. Sprung Bird Wire Systems can be adapted to fit almost any building or architectural feature. This system is only suitable for light to medium Pest Bird Infestation pressures. Should your building have a lot of ledges or other, similar architectural features like parapets and balconies, then you will no doubt already know how annoying pest birds can be. Especially in urban areas, where the pigeon and gull populations are often out of control, pest birds will roost wherever they can. High perches give them the perfect view for spotting food- but for those who own and maintain these buildings, the pest birds can cause some serious problems. Not only will the birds foul all over the property, which can even end up doing structural damage, but gulls in particular also make a massive amount of noise. This can be incredibly annoying to those inside, so for those suffering from a pest bird problem, the issue will need to be dealt with as quickly as possible. If you are in need of a fast, effective way of keeping birds from roosting and nesting on your property, then a bird wire system certainly fits the bill. Discrete yet efficient, these pest bird wire systems are suitable for protecting ledges, parapets, signs, beams, architectural features, and more. These systems are typically made up of two or more thin steel wires, which are kept tense to present a strong physical barrier between the pest birds and the ledge. The wires get in the birds’ way and prevent them from landing as they normally would. When presented with such a barrier, they will usually just give up and fly off somewhere else. Even if they do make their way through the wires, the birds will find that they are extremely uncomfortable sitting there and likewise abandon the ledge for a more agreeable perch. Not only are pest bird wire sprung systems highly effective at keeping birds away from your building, but when installed by a professional, they are also extremely discreet. Even from just a few metres away, it can be very difficult to spot the wires. However, any pest birds that try to land on your ledges will quickly discover for themselves that there is indeed something stopping them from landing there. Rather than having an easy time of fouling all over your property, they have no choice but to fly off again. At Pest Solutions, we deal with pest bird problems on a daily basis. That means we are hugely experienced in treating these issues and can use a variety of different solutions to keep pest birds away from your property. Often, a simple bird wire system is enough to deal with small-to-medium-sized infestations. However, to find out whether or not this approach will work for you, we are pleased to offer a completely free survey to anyone interested in our pest control services. One of our expert pest control technicians will come out to your property to assess the issue at hand and come up with the optimal solution to deliver the results that you need. All of our pest bird control specialists have been highly trained to ensure they can tackle any problem they might face in the course of their work. They carry IPAF and PASMA certification, meaning they are qualified to work at heights- essential for keeping pest birds at bay. No matter how out-of-the-way the area in question might be, our experts will be able to install bird wire systems that can get the job done and stop your pest bird problem in its tracks. Pest Solutions has teams of hugely knowledgeable pest control management professionals in our local branches across the UK. That means they are in your city, ready and waiting to help you tackle any pest bird issues you might be facing. Our service teams are perfectly located to help you get rid of your unwanted pest issues and always respond fast. Don’t let pest birds take control of your ledges and rooftops. Instead, call in the experts at Pest Solutions, and watch as the infestation disappears virtually overnight. Find your local Pest Solutions branch here, or simply call 0800 027 2555 today for a FREE survey or to arrange a service technician visit.